September 27, 2009 by rwb, under Microcontroller. The I2C bus (read as I squared C) is one of the most important embedded system serial bus interface first introduced by Philips in 1980; using just two lines called SCL (serial clock) and SDA (serial data) respectively make the I2C bus is a perfect choice to provide additional I/O capabilities to your microcontroller project without changing your microcontroller type and design in order to increase the I/O port pins. Today there are plenty choices of I2C slave I/O port expander devices available on the market such as Philips PCF8574 and Microchip MCP23008 for addressable 8-bit general I/O ports which capable of handling I2C standard bus speed of 100Khz or fast speed mode of 400Khz; the Microchip MCP23008 even can handle up to 1.7Mhz bus speed. You could read more information about using I2C interface on my previous posted blog How to use I2C-bus on the Atmel AVR Microcontroller. 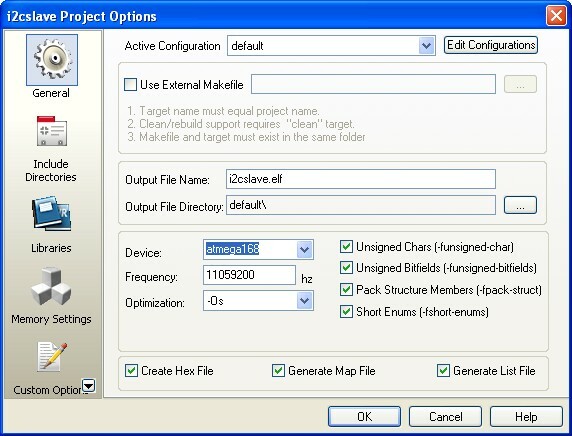 The usage of I2C slave devices is not merely for the I/O expander but it also use to expand your microcontroller capabilities as well as it’s functionalities such as the I2C real time clock from Maxim DS1307 (Using Maxim DS1307 Real Time Clock with Atmel AVR Microcontroller), Microchip TC1321 10-bit digital to analog converter (DAC), Microchip MCP2331 12-bit analog to digital converter (ADC), Microchip MCP9801 high accuracy temperature sensor and Microchip 24AA128 16KB EEPROM. Although there are many types of sophisticated I2C slave devices available on the market, sometimes we need the I2C slave device which has the capabilities beyond that, something more powerful, more flexible and yet easy to be configured; the answer to this requirement is to use the microcontroller it self as the I2C slave device, that is why most of the midrange class microcontrollers have the I2C slave peripheral feature build inside it. This is what we are going to learn on this tutorial, where the principal we learn here could be applied to other microcontroller type as well. 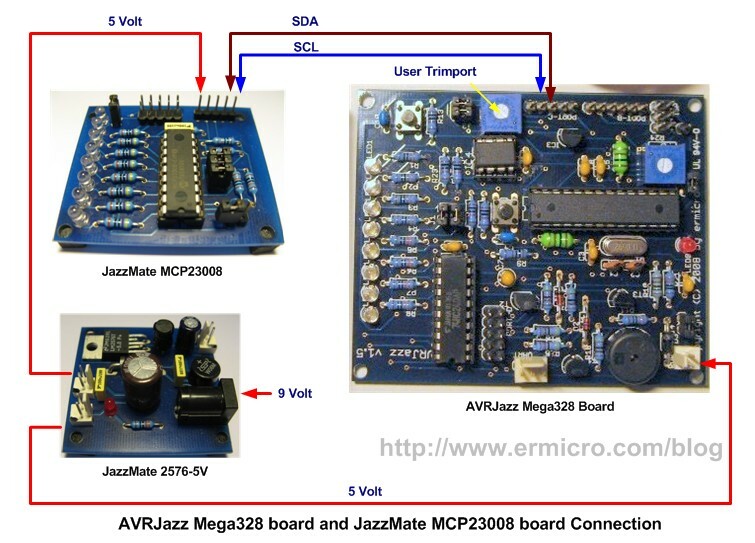 AVRJazz Mega328 board from ermicro as the I2C master controller which base on the AVR ATmega328P microcontroller (board schema). 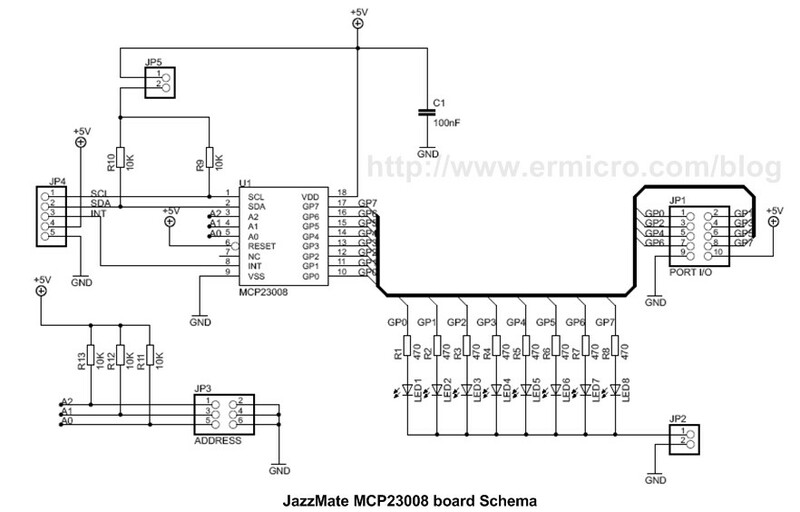 JazzMate MCP23008 board from ermicro which base on the Microchip MCP23008 8-bit I2C I/O expander. 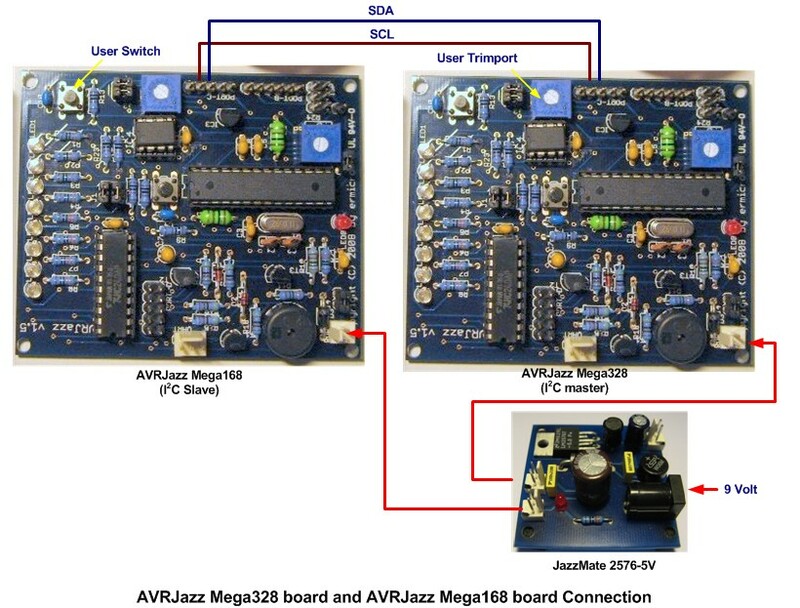 AVRJazz Mega168 board from ermicro as the I2C slave device which base on the AVR ATmega168 microcontroller (board schema). STK500 programmer from AVR Studio 4, using the AVRJazz Mega328 and AVRJazz Mega168 boards STK500 v2.0 bootloader facility. As the I2C slave device, mean the MCP23008 will be the passive device that depends on the I2C master device to initiate the communication. On this tutorial I will use the AVRJazz Mega328 learning board as the I2C master controller; the following is the C code for the I2C master controller. In order to communicate with MCP23008 I2C slave device, the I2C master controller first has to send the START condition to take control of the I2C bus and continue with the I2C slave device 7-bit target address which consists of 4-bit MCP23008 I2C slave identification ID (0100) and 3-bit configurable address (000 to 111) follow by 1-bit of the read (TW_READ, logical “1“) or write (TW_WRITE, logical “0“) operation. After receiving its own 7-bit address then the I2C slave device will response to the I2C master controller by sending the acknowledge (ACK) signal. Once the I2C master controller receive the I2C slave address acknowledge (ACK) signal, then it will start to send the requested register address to the I2C slave device. The I2C master controller then will continue to send the data to this register (GPIO) after the acknowledge (ACK) signal from I2C slave. Next the I2C master controller will close the communication by sending the STOP signal to the I2C slave. Reading data from the MCP23008 I2C slave device required two phase, the first one is to tell the I2C slave device which register that we want to read; this required the write operation and then send the stop signal to the I2C slave device. 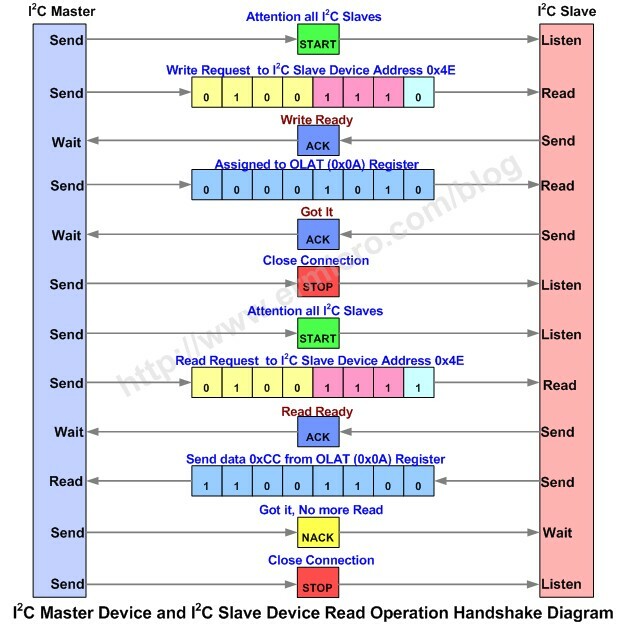 The second phase is the actual read process; the I2C master than resend the START signal or known as restart signal again followed by I2C slave 7-bit address with read operation and it wait for acknowledge (ACK) signal to be replied by the I2C slave device. Once the I2C slave response with acknowledge (ACK) signal then the I2C master will enter the master receive mode and the I2C slave will continue to send the requested register data to the I2C master. Once the I2C master receive the data it will reply the no acknowledge (NACK) signal to the I2C slave device which tell the I2C slave that the read operation is finish and then the I2C master close the connection by sending the STOP signal. After initiate the TWI (Two Wire Interface) peripheral (Atmel’s implementation of the Philips I2C trademark interface) by calling the i2c_init() function, then we initiate the MCP23008 general I/O (GPIO) port for output. This could be done by assigning the 8-bit I/O direction register (IODIR) to 0x00. 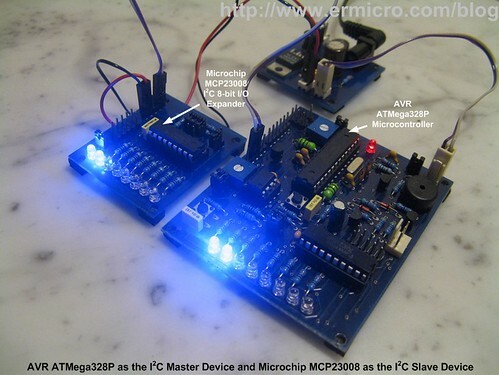 You could read more about using the Microchip MCP23008 as the I2C I/O expander in my previous posted blog Build Your Microcontroller Based PID Control Line Follower Robot. Inside the infinite for loop, we simply read the ADC result from the user trimport; then we write the LED pattern (led_pattern) to the MCP23008 GPIO register and then read the OLAT (Output Latch) register which represent the last value on the GPIO register; this give us an example of read operation from the MCP23008 I2C slave device. The 8-bit data read from OLAT register simply act as the output feedback data and we pass this data back to the ATMega328P PORTD. Make sure the Device selected is atmega328p and the Frequency use is 11059200 Hz. After compiling and simulating our code we are ready to down load the code using the AVRJazz Mega328 bootloader facility. The bootloader program is activated by pressing the user switch and reset switch at the same time; after releasing both switches, the 8 blue LED indicator will show that the bootloader program is activate and ready to received command from Atmel AVR Studio 4 STK500 program. We choose the HEX file and press the Program Button to down load the code into the AVRJazz Mega328 board. 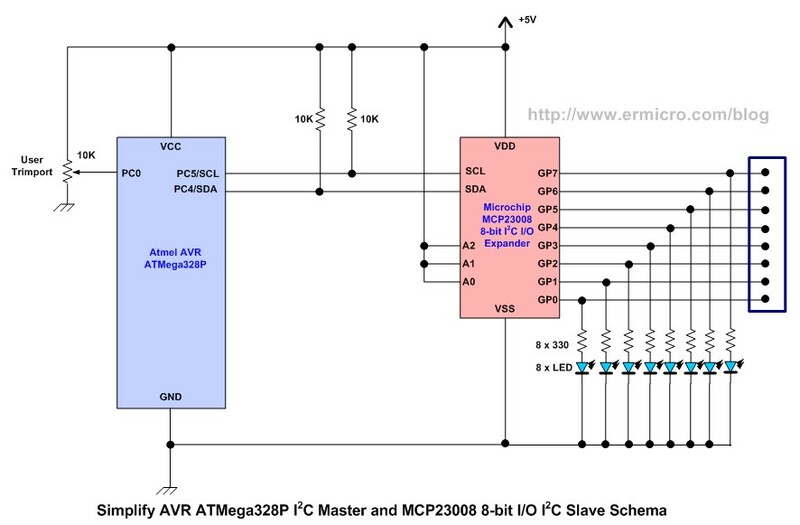 On this last AVR I2C Slave tutorial we will transform the AVR ATMega168 to the I2C slave I/O device; as mention above we will use the MCP23008 I2C I/O expander as our I2C slave model. 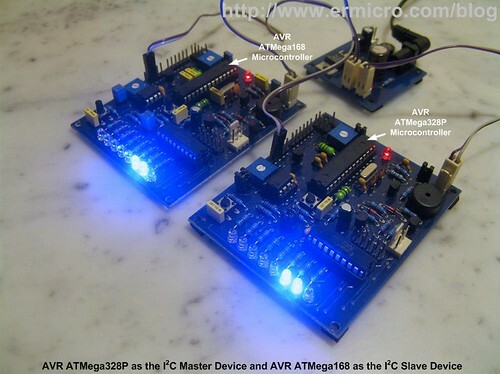 By emulating the MCP23008 chip using the AVR ATMega168 microcontroller we will have a good example of how to utilize the AVR ATMega168 TWI (I2C) slave peripheral feature and at the same time it will serve as a learning tools of how to program the microcontroller’s base I2C slave device. The AVR ATMega168 has build in I2C (TWI) peripheral both as master or slave, most of the AVR microcontroller families have these features and some of them (tiny families) shared the TWI pins (SCL and SDA) with other serial peripheral pins such as SPI (Serial Peripheral Interface) which usually called as the Universal Serial Interface (USI) (e.g. ATTiny2313, ATTiny24, ATTiny861). As you’ve learned from the MCP23008 I2C I/O expander above, that every I2C slave device must have the 7-bit address for its identification, the ATMega168 microcontroller implement this I2C slave address identification in the TWAR (TWI Address) register (for more information please refer to the ATMega168 microcontroller datasheet). Of course if you want to attach more ATMega168 microcontroller as the I2C slave on the same bus, you have to differentiate the address for each of them, theoretical you could attached up to 128 I2C devices on the same I2C bus. The 8-bit TWDR (TWI Data Register) register is responsible to receive and send the data to or from the ATMega168 microcontroller I2C slave peripheral. Therefore by simply reading this register or writing to this register we could receive or sending the data through the I2C bus. The last two important register for the ATMega168 microcontroller I2C slave peripheral operation are TWCR (TWI Control Register) and TWSR (TWI Status Register). To operate the ATMega168 microcontroller in I2C slave mode, first we have to enable the TWI peripheral by setting the TWEN (TWI Enable) bit of the TWCR register to logical “1” and to enable the acknowledge signal for the I2C master/slave handshake we set the TWEA (TWI Enable Acknowledge) bit of the TWCR register to logical “1“. Every time the I2C master communicate with the I2C slave, the TWSR register will be updated with valid status code and set the TWINT (TWI Interrupt) flag to logical “0“, the valid status read from the TWSR register will be used by software implementation to decide the action required to complete the I2C master/slave communication. The TWINT flag bit has to be reset by software before we start to the next I2C master/slave handshake. 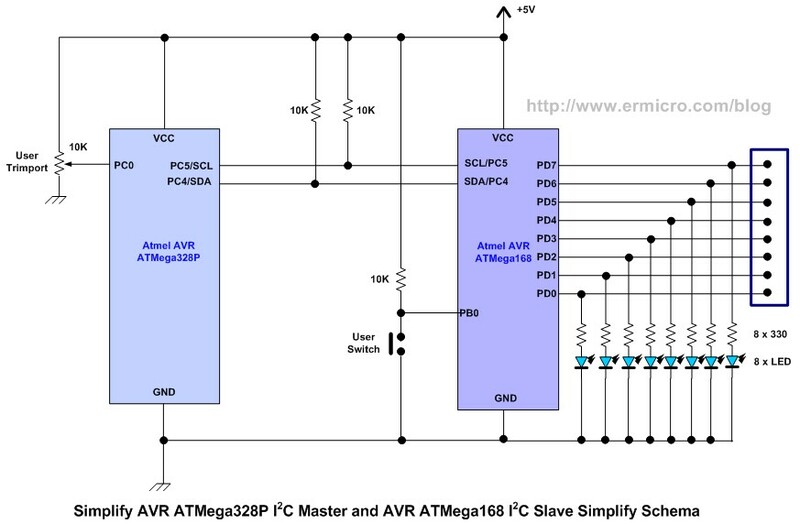 The ISR(TWI_vect) and i2c_slave_action() are the C code that implement the AVR ATMega168 microcontroller I2C slave peripheral. Actually there is one more register left for the AVR ATMega168 microcontroller I2C slave peripheral operation named TWAMR (TWI Address Mask Register) which is use to disable the corresponding bit in the TWAR register when set to logical “1“. This could be used to change the I2C slave address identification without changing the TWAR register content. To make the program more interesting and at the same time demonstrating of how we could implement more advance application to the microcontroller’s based I2C slave device; I decided to use the AVRJazz Mega168 user switch attached to the ATMega168 PB0 to manipulate the simulated MCP23008 OLAT register data in the i2c_slave_action() function. As you notice from the C code above if the olat_mode variable equal to 1, then the MCP23008 simulated OLAT register will return different LED pattern that is taken from the led_pattern variables. The olat_mode variable is controlled by pressing the AVRJazz Mega168 board user switch read from the ATMega168 PB0 port status inside the infinite for loop. 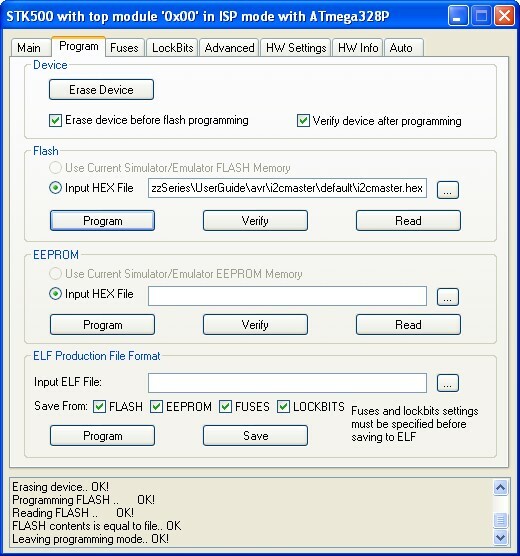 The usage of microcontroller’s based I2C slave device opening the enormous chances to build more advance embedded system application, where you could attached multiple microcontroller and freeing your master microcontroller (I2C master) to perform the main logic for your application, while the co-microcontroller (I2C slave) could be programmed to do just a specific task such as advanced PWM motor controller, multiple servo controller (robotics arm and leg), LCD controller (driving LCD display through I2C), smart sensors and many more. Last what I like the most is, you could mix and match the microcontroller brand and type such as Atmel AVR families and Microchip PIC families, where you could take advantage of the features and strength of both microcontrollers to support your embedded system application. Thank you very much for sharing this , I think this is one of the smaller codes I’ve seen for I2C. There is only one typo on the master listing that makes the I2C not work if the files are compiled as they are. hi. am trying to connect two slaves to one master using your code. am using atmega 16. the master works well with one slave but when i include the second slave, communication stops after some time. what changes can i perfom on the slave code to include a second slave. your help will be greatly appreciated. Make sure you communicate with only one slave at the time. Do anyone know how the device address is derived(MCP23008_ADDR 0x0E // MCP23008 Device Address)?